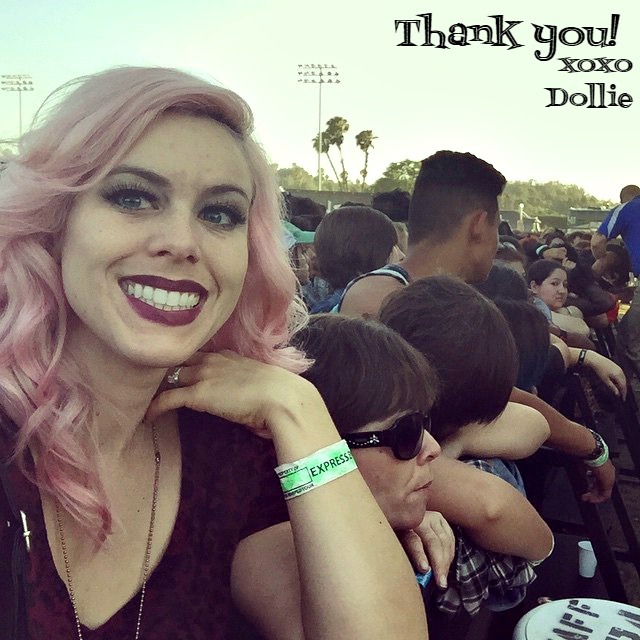 This is a guest post by Dollie DeVille, of The Rockabilly Socialite blog. 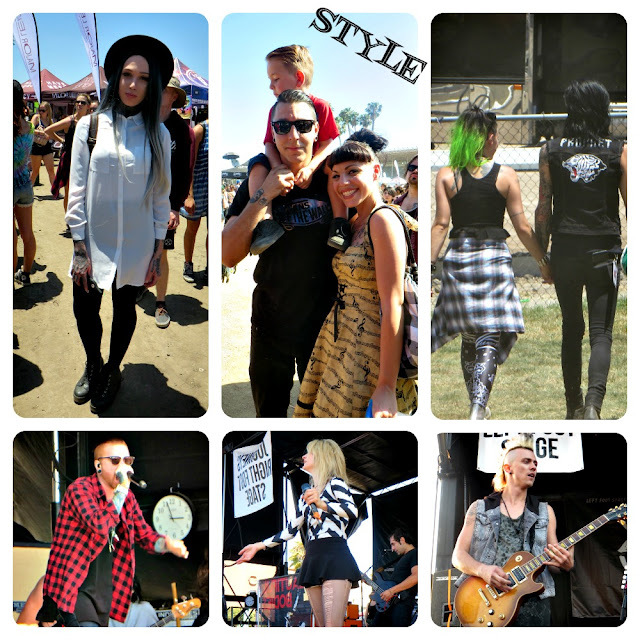 She attended multiple dates of the Vans Warped Tour to cover the fashion and music at the festival for the Durango Leather blog. All views and opinions are Dollie’s. Follow her on Instagram for more music and fashion photography. I have always been a fan of rock music, from its deep southern roots to modern top 40 bands. As the author of a popular rockabilly music blog, The Rockabilly Socialite, my life basically revolves around music. In addition to seeing as many local shows as I can, I also attend as many major music festivals as possible. Probably over ten a year across the US. When I am enjoying this favorite weekend activity, I also like to look good while doing it. 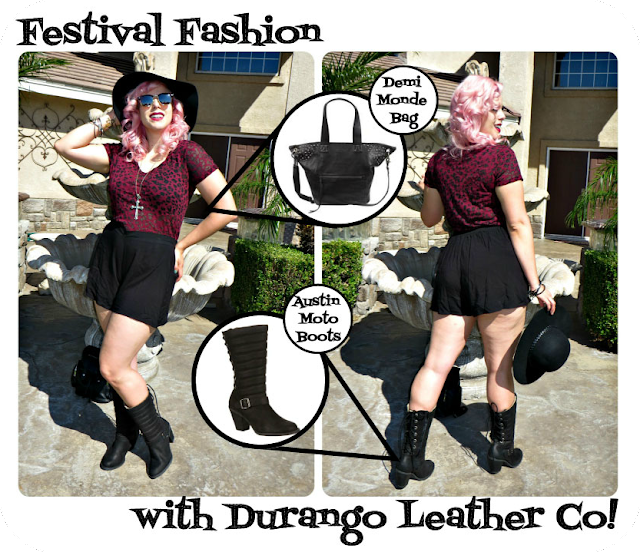 So when Durango asked me if I wanted to cover a summer music festival for a guest post, I jumped at the opportunity. I thought Warped Tour would be a good choice due to the diversity in musical genres. They really have something for everyone, from hip hop to rock and electronic to punk. They don’t stop at music though, they even have stand up comedians and motivational speakers now. I got to follow the tour around southern California and attend multiple dates, so I got to see a little of everything. Or, at least it felt that way! 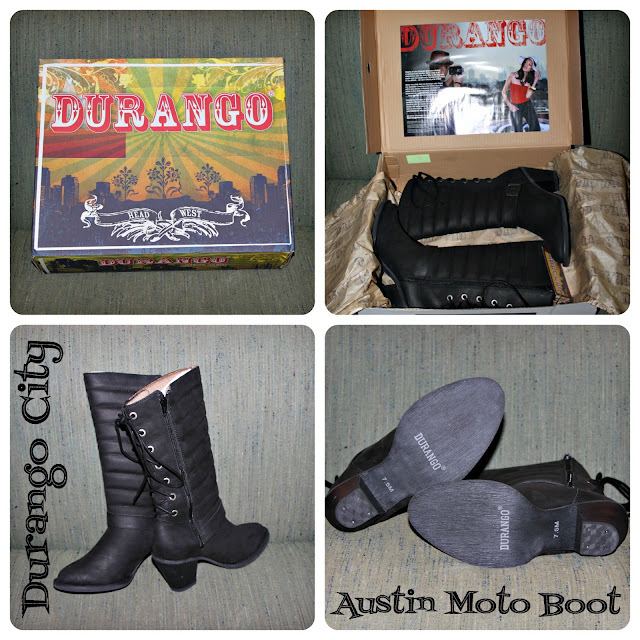 While I was flying solo and having the time of my life, I had the Durango City women’s Austin Moto Boot by my side. Or rather, on my feet. These boots protected my feet while providing just a little bit of height to help me see over the crowd. The lace up back allowed me to adjust the tightness as needed throughout the day, and the zipper came in handy when I needed to get out of my sweaty clothes as fast as possible at the end of the night. It didn’t hurt that they were cute too, and looked great with everything I paired them with. I got so many compliments! While there I happened to spot some other great festival fashions and tried to take photos whenever I could. I loved this woman’s hair, airy white top and black accessories. I also dug the rockabilly look of this little family. Don’t they look so cute together? They were all having a great time too. Fans of Black Veil Brides are likely familiar with Juliet Simms, as she is Andy Biersack’s long time girlfriend. She was on this years Warped Tour to promote her new EP, All Or Nothing. 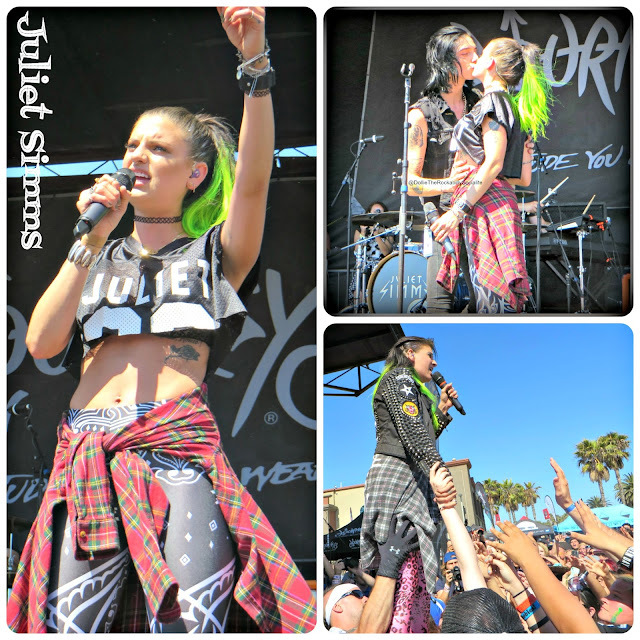 On the opening day of Warped Tour in Pomona Ca she seemed to be having difficulties hearing out of her in-ear monitor but she overcame it and delivered a great show. As a great surprise, Andy joined her on stage to sing “Not Broken Yet” with her. It was a huge treat! One of the best things about attending large festivals like this is the opportunity to discover new music. The best way I have found to find bands you may like is to research the bands on the lineup on YouTube. I also listened to the 2015 Warped Tour playlist on Spotify (free!) and made note of any bands I ended up liking. Then I made sure to see as many of those as I could. Another way to find new bands is to follow the social media pages of record labels you like, like Epitaph, Rise and Standby. That is how I found The Relapse Symphony. Boy, am I glad I did! I got to see them a few times at Warped and they blew me away with their energetic show. Bret Von Dehl is a natural born front man. I picked up their first album Shadows and their new release Burn To Burn. I currently have them on constant repeat! A few other bands I got to see for the first time were New Years Day, Pierce The Veil. Moose Blood, Beartooth, Beautiful Bodies, Palisades, Onward, Etc. and PVRIS. I was really impressed with Ashley Costello of New Years Day. You can tell she loved being on stage and is just as cute as a button. The same goes for Beautiful Bodies, which I didn’t think I would like based on their recordings, but was pleasantly surprised with their live performance. I didn’t know what to expect from PVRIS but I was so happy to see that the lead singer Lyndsy also played guitar. I think she was one of only two women I saw play guitar that day. We need more women playing instruments! Being an acoustic lover, I knew I had to see Onward, Etc. after hearing his music online. He was one of the only bands I saw that was stripped down and raw. I loved it. Lastly, I heard Moose Blood while I was standing around waiting for another band’s set. I ended up becoming obsessed with their song “Bukowski” after hearing it live and buying the Warped Tour Compilation album. This festival was so much fun! Weekends don’t get much better than this. 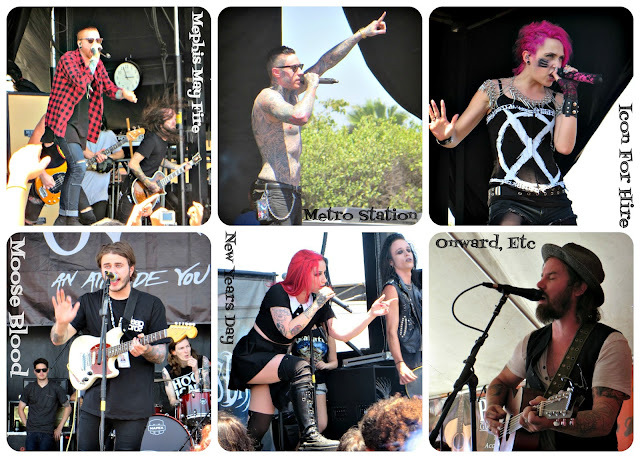 Thank you so much to all of the bands that go on stage everyday for fans like me. Thank you to Durango Leather Co. for letting me share my love of music with you all!